December 1, 2018 - by benign0 - 5 Comments. Suddenly Katipunan Road is “home” to every UAAP basketball fan and, worse, to every millennial “social justice warrior” (SJW) and her cat. Now I know what it feels like to be an indigenous inhabitant of Boracay Island whenever the LaBoracay crowd comes to town. 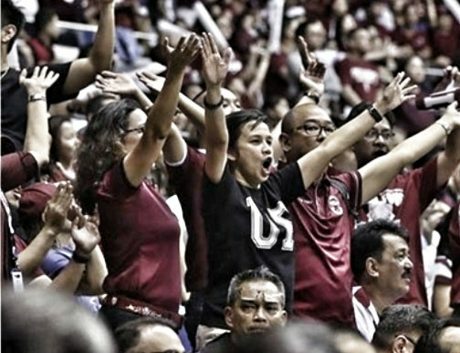 A basketball “battle” of the Katipunan universities is a relatively rare occurrence considering that the University of the Philippines rarely ever reaches this point in the race to UAAP supremacy. Usually it is a battle between the two chi-chi schools — the Ateneo and La Salle (both the “De”-prefixed one and the “Greenhills” suffixed one). This year the bandwagon trundling along Loyola Heights’ main thoroughfare is sagging under the weight of the shrill basketball fandom who’ve jumped on it. Some of these bandwagoneers even jumped in for the wrong reason — to politicise the game. So now Katipunan Road is having its day under the limelight. It’s an opportune time to reflect on the parallels between the once-quaint road I grew up on and the once-pristine island of Boracay. Over pretty much the same timeframe, both transformed from oases of class into obnoxious citadels of crass consumption and playgrounds of the wannabe “wokes” of today’s youth. Indeed, both Katipunan Road and Boracay are victims of that renowned Filipino Reverse Midas Touch. I don’t claim to own Katipunan just because I grew up there. In fact, the Katipunan has long been a melting pot for youthful get-togethers from all over the country. That’s because the two illustrious universities there have long been powerful magnets for Filipinos seeking world-class learning. Back then, back before heavy traffic, and back before a cottage industry of expensive private schools sprung campuses in other parts of Metro Manila, high school kids from as far away as Alabang would be enrolled at the Ateneo grade school and high school. And even with travel times from those frontier suburbs hardly ever exceeding an hour in those days, these kids from far away would come in car pools and shuttlebuses and be at school just after sunrise (us locals found solidarity at the queue for late slips most mornings). Members of today’s wokedom, however are different creatures. They go out of their way to assert ownership over iconic places and once-innovative ideas. They owned “human rights” and turned that once-noble notion into a sad punchline. They built an ironic fence around “democracy” and screeched about the “freedom” it enables. They speared Boracay’s sands with flagpoles and flew rainbow-coloured banners in between tossing plastic water bottles onto its beaches. Now they come to Katipunan (mostly digitally) to presume to tell all Filipinos to wear black during the games. That’s just not on. Trust what is essentially a small clique of shrill “activists” to presume to know what is good and what is bad and, worse, share with everyone those rotten pieces of their small minds. For a bunch of bozos who like flying rainbow-coloured flags, they seem to be really quick to prescribe specific colours to wear whenever they call on the public to get together around their next moronic “advocacy”. Filipinos should be polite and simply say, “No thanks.” NO to shrill small-minded activism. No to the colours prescribed by the LaBoracay crowd. Let’s just enjoy the basketball games the way they were meant to be enjoyed — with a healthy dose of the once-fun political incorrectness that marked the real collegial competitiveness of Old Katipunan Road. The dull mind, once arriving at an inference that flatters the desire, is rarely able to retain the impression that the notion from which the inference started was purely problematic. They just want to emulate the US with this kind of stupidity. ESPN turned into a joke when they try to mix sports with politics. BTW, sports, not politics, brought us together. I agree because in 2016 there really was a certain flavor among the radio talk guys and certain people like Ryen Russilo did wonder out loud why there seems to be this expectation. Then different sides tried to make an issue theirs and it became owners vs employees etc. Tom Brady caught with a MAGA hat and questioned. Even if he really is a personal friend of Trump. The whole you have to conform to us. Oddly enough in the US a predetermined committee is deciding which 4 college football teams will be in the hunt for the championship which will ultimately be decided on the field Dec 29 and Jan 7. Factors include record, strength of schedule, injuries , common opponents and other things. Imagine if you will that somebody inserted the thought of Nixon and Trump in there how much it would be ridiculed . Well that is what is happening here. Insert Marcos, Duterte and 1986 revisionist history. But of course I continuously mock what passes for sports writing here. Whether they can not be critical of their own god or the fact they insist on giving their own meaning to English words. Our press is owned by dilawan and will not ridicule dilawan ideas that further the dilawan misinformation efforts. Look how much coverage Dengvaxia victims are getting. Furious doctors who have reputations and who know the score have taken to Twitter going on record with vaccinated children who have died . A story the press chooses to sweep under the rug. Instead we have the BS of “wear black”. Whatever happened to ” be true to your school“? Replace it with that Tony Orlando and Dawn song Cory loves? ?